Enhanced analytics included in the new version give dealers detailed reporting options such as in-app user behavior and user action metrics. 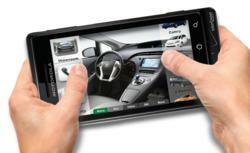 AutoMotionTV not only creates mobile apps for dealers, but assists in promotion. AutoMotionTV works hand in hand with dealers when launching a new app to ensure apps get into thousands of customer’s hands. Getting started with the AutoMotionTV Dealer App is simple and cost-effective. Apps can be launched within a few weeks and can be customized to suit specific dealer needs.